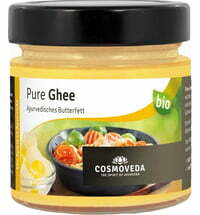 Ghee is a term used in Indian cuisine and is best described as being concentrated butter. In Central Europe is is vastly being used for cooking and frying. However, in Ayurveda, a wide range of health benefits are attributed to the properties of ghee. In Europe, ghee is usually produced industrially. The water contained in the milk as well as the milk protein are removed. What remains is merely the fat. As such, concentrated butter has some advantages over conventional butter. Concentrated butter can be heated at 190 degrees Celsius, without the fear of oxidising the fatty acids found in the concentrated butter. This makes it ideal for baking, roasting and frying. It is also more durable and easier to be stored than butter and can be easily digested by those who suffer lactose intolerance. Ghee is composed of nearly 100 percent fat, of which approximately 60% are saturated fatty acids, 30% are monounsaturated and 5% polyunsaturated fatty acids. It also contains the fat-soluble vitamins A, D and E, that are also found in conventional butter. In Ayurveda ghee plays a very important role. It is used not only for cooking but is attributed to a variety of beneficial effects, which is why it is also referred to as the elixir of life or golden elixir. In some cases, even more complexly manufactured ghee is used for healing purposes. In these cases,the production then takes up to 100 hours and it is additionally enriched with herbs. It nourishes the body tissues, by acting as a carrier medium. The active ingredients are transported into the body and absorbed by fat permeable cell membranes. The intake of ghee helps to keep the three doshas in equilibrium. Ghee is capable of binding environmental and body toxins and releasing them from the body. For those of you who would like to give ghee a try, have the possibility of producing yourselves. All you need is fresh, unsalted butter and let it simmer on low heat for 30 to 40 minutes. The water contained in butter evaporates, the protein precipitates and accumulates in form of foam at the surface. The foam is then scooped out until not form is formed any longer. Thereafter, the liquid is sieved through a cotton cloth or coffee filter. Ghee lasts up to twelve months when stored when refrigerated at 4 degrees Celsius or up to three months when stored uncooled. However, in Ayurveda it is recommended not to store it in the refrigerator because it can perish more easily through moisture, reducing its quality.